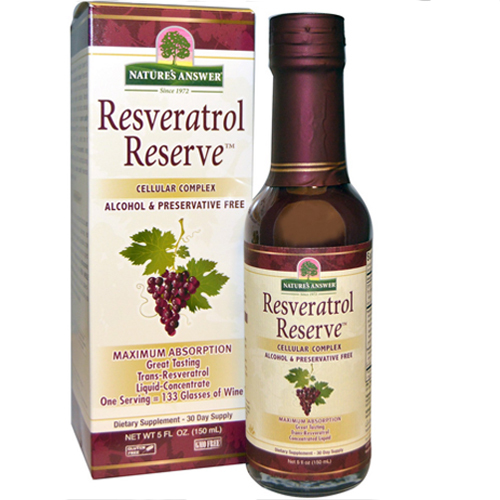 Resveratrol Reserve from Nature`s Answer is the most technologically advanced resveratrol available on the market. Nature`s Answer only use the purest, most potent ingredients obtainable. Resveratrol is a chemical constituent that has been isolated from grapes, red wine, blueberries, red berries, and Japanese knotweed. Muscadine is the variety of grape (berry) known to have the highest concentration of ellagic acid and anthocyanins. Nature`s Answer extract only fresh, whole muscadine grapes (berries) in their own state-of-the-art extraction facility to bring you the highest quality extract available. 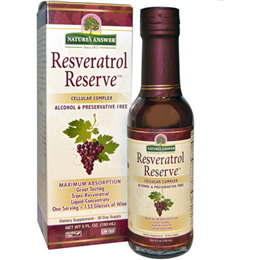 Nature`s Answer Resveratrol Reserve is super concentrated so that you can reap the healthful benefits of resveratrol. Proprietary Resveratrol Blend (RestoreVetrol): Red Grape Juice Concentrate, Grape Skin Extract, Trans-Resveratrol 99% Root Extract (Polygonum cuspidatum), Muscadine Grape Juice Extract, Muscadine Grape Pomace Extract, Red Wine [Red Grape Pomace (Skin and Seeds) Extract). Proprietary ORAC Blend: Pomegranate Juice Concentrate, Red Raspberry Juice Concentrate, Purple Corn Cob Extract. Other Ingredients: Vegetable Glycerin, Purified Water, Xantham Gum, Quik-Sorb (Ginger Rhizome, Amla Fruit, Capsicum Fruit). As a dietary supplement mix 1 teaspoon (5ml) with an equal amount of water, once daily. Swish and hold liquid in your mouth for 30 seconds. Swallow and then follow with 115ml of water to support maximum absorption. Below are reviews of Nature`s Answer Resveratrol Reserve Complex - 150ml by bodykind customers. If you have tried this product we'd love to hear what you think so please leave a review.